Don’t let osteoporosis erode your bones! Learn what you can do now to keep your bones strong and lower your risk of osteoporosis-related fractures. Osteoporosis can be intimidating and inhibiting. The prospect that a simple fall could break your hip or wrist can make you watch every step you take. Fear can replace the freedom to do all the things you love. The two major risk factors for osteoporosis are being a woman and having passed through menopause. In the years after menopause, women can lose up to one-fifth of their bone mass. But men aren't immune to the disease. Two million American men have osteoporosis and one in four over age 50 will suffer an osteoporosis-related fracture. 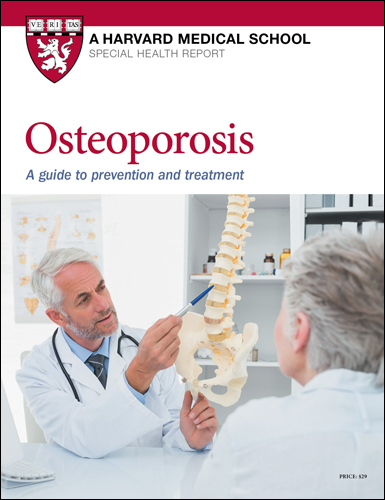 In Osteoporosis: A guide to prevention and treatment, Harvard Medical School doctors will show you the positive, proactive, and practical steps you can take to protect your bones now and in the years ahead. You will be alerted to red flags that signal you’re at greater risk for a broken bone. You'll be warned about medications that hasten bone loss. And you’ll find out if you should have your bone density checked — and which tests are the best. The report will show you the importance of getting calcium from food and vitamin D from sunlight. You’ll learn about other bone-protective strategies, too, including specific exercise routines, and discover some surprising foods that help weaken bones. Osteoporosis is not inevitable. The good news is there’s a lot you can do to shield your bones from this disease. And the sooner you act, the better off you — and your bones — will be. While experts recommend getting your nutrients from foods instead of supplements, you may find that it just isn’t practical or possible for you to get all the calcium you need from your diet. In that case, a supplement can shore up your calcium intake and your bones. In fact, in one analysis of several studies of postmenopausal women found that the women who took calcium and vitamin D supplements for at least two years were 23% less likely to suffer a spinal fracture. A dizzying array of calcium supplements is available—so many, in fact, that choosing one can be tricky. You can choose from flavored chews, pills, chewable tablets, and liquids. When making a decision, it’s wise to consider cost, convenience, and how well your body tolerates the supplement. Calcium carbonate tends to be the best value, because it has the highest amount of elemental calcium. Elemental calcium is the actual amount of calcium in each supplement. The compound calcium carbonate contains 40% calcium by weight, while calcium citrate is 21% calcium. This means that you may need to take more tablets of a calcium citrate product in order to meet your daily needs. Because calcium carbonate requires stomach acid for absorption, it’s best to take this product with food. Most people tolerate calcium carbonate well. However, some people complain of mild constipation or feeling bloated. Some well-known calcium carbonate products include Caltrate, Viactiv Calcium Chews, Os-Cal, and Tums. On the other hand, calcium citrate is absorbed more easily than calcium carbonate and can be taken on an empty stomach. But as mentioned above, you may need to take more tablets to get your daily requirement. Calcium citrate products include Citracal and GNC Calcimate Plus 800. In weighing your options, check the labels of products to see what the serving size is and what the “% Daily Value” for calcium is. The “% Daily Value” reflects how much elemental calcium is in the product. The Daily Value is set by FDA regulations and is not the same as the Recommended Dietary Allowance (RDA). Currently, the Daily Value for calcium is 1,000 mg—the RDA for people ages 19 to 50, not the 1,200 mg RDA for older adults. Since the “% Daily Value” for all calcium supplements is 1,000 mg, simply multiply the percentage listed by 10 to find out how much elemental calcium the product contains. For example, if the label says the product contains 40% of the Daily Value, it has 400 mg of elemental calcium. You’ll find that the serving size and “% Daily Value” vary from product to product. For example, one Viactiv Calcium Chew contains 500 mg of calcium, while two Tums E-X antacid tablets provide 600 mg. One company may offer several different supplements, with varying amounts of calcium. In addition, some supplements may include vitamin D while others don’t. Reading the labels with an eye toward cost and convenience may help you sift through your options. Would you find it inconvenient to take several tablets at a time? How many tablets or chews does the package contain, how many must you take at a time, and what is your cost per serving? While products that yield a high amount of calcium may seem to be the best bet at first blush, they may not serve you best. Because your body has difficulty absorbing more than 500 mg of calcium at a time, more of the mineral may go to waste. So while you may think that you’ve met your daily requirements by taking that 1,000-mg calcium pill, you may actually be only halfway to your target.